With victories at some of cycling's biggest races, Greg Van Avermaet has earned the role of team leader at CCC Team. The 2016 Olympic road race champion and 2017 Paris-Roubaix winner had recorded 38 wins heading into the 2019 season including two Tour de France stage wins, back-to-back Omloop Het Nieuwsblad titles, victory at E3 Harelbeke and Gent-Wevelgem, and an overall win at the Tirreno-Adriatico stage race. 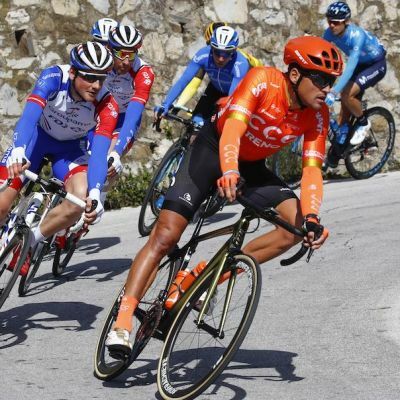 Van Avermaet’s palmarès is bolstered by two stints in the yellow jersey at the Tour de France, most recently in 2018 when he held the jersey for eight days. Sheer determination to win races is the Belgian’s signature, and his trademark victory salute has been a regular sight when the stakes are high. When I was 18 years old and I rode my first race and it was pretty good. Greatest racing memory: Winning the Olympic gold medal because it was a really special moment in my career. And also because of the history with my father, he was in the Moscow Olympics iin 1980, so I grew up with this story. Race I dream of winning: Tour of Flanders – because it’s a race close to my home on my training roads, and just the atmosphere around is really nice. If I wasn't a pro cyclist: Probably something in sport, something active or helping sports people to perform better.